In front of the U.S. military Gimbaru Training Area, on July 31, Kazuo Kimura, the managing director of the Okinawa Defense Bureau (second from right), takes receipt of handover documents from Tsuyoshi Gibu, Head of Kin Town. The United States military returned the Gimbaru Training Area to Kin Town and other owners, on July 31, 54 years after the land was appropriated for military use. 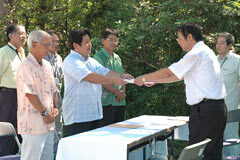 Twenty-three hectares of a total area of 60 hectares were handed over to the owners. Thirty-three hectares will be returned to the landowners after the completion of works including the removal of buildings and researching and analyzing the environment for residual pollution using the likes of a magnetic survey. Four hectares of state-owned land and ridou, or old public road without lot-numbers, will be transferred to the Town. A total of 43 individuals and organizations, including Kin Town, own land inside the Ginbaru Training Area. Because the government will not pay a rental fee for the land, special financial compensation will be paid to the landowners for up to three years from August 1, the day that the land is returned. The return of the Ginbaru Training Area was agreed upon by the governments of the United States and Japan in the final report of the Special Action Committee (SACO) in 1996. However, there was a delay in the return process because it was decided that the helipad in Ginbaru should be moved to the Blue Beach Training Area in the same town, and so the return of the Training Area was significantly delayed beyond the scheduled date of the end of 1997. The Training Area is the fifth facility that the final report of SACO agreement decided should be returned. Meanwhile, the U.S. military has often carried out helicopter landing drills outside the helipad in the Blue Beach Training Area, despite the government having promised that the helicopter landing drills will fundamentally be held at the helipad. Town officials have protested to the U.S. military, and requested that they hold the drills at the helipad within the Blue Beach Training Area.